Goddess Saraswati is believed to be the Goddess of knowledge. Goddess Saraswati is worshipped during the Dassera or Navaratri festival. Goddess Saraswati is worshipped on the day when the star of the day is Moola or on the day when there is Moola nakshatram. Goddess Saraswati puja this year is on Tuesday, 5th October 2038. 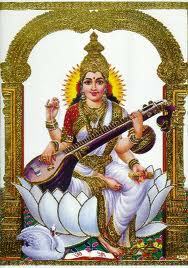 Saraswati Puja is observed as per regional basis in India. The following is the way it is celebrated in different parts of the country. On Maha Saptami Avahana of Goddess Saraswati. On Durga Ashtami Main Puja of Goddess Saraswati. On Maha Navami Uttara Puja of Goddess Saraswati. On Vijayadasami Visarjan of Goddess Saraswati. In Andhra Pradesh the importance is for Nakshatra and Saraswati puja is performed on the day when there is Moola Nakshatram. In Tamilnadu Saraswati pooja is done along with Ayudha Pooja.